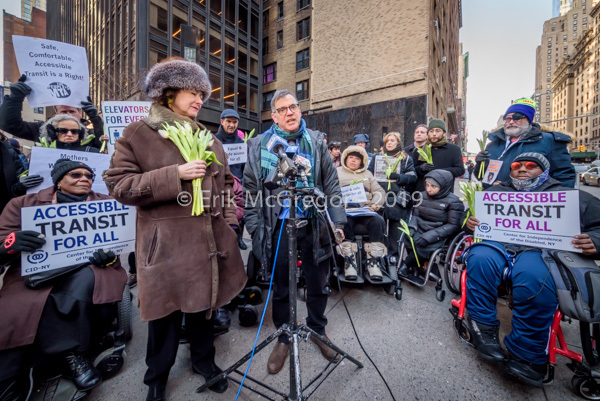 New York, NY – Members of disability and transit groups, and advocates for pregnant women such as Brooklyn Center for Independence of the Disabled (BCID), Center for Independence of the Disabled, New York (CIDNY), Bronx Independent Living Services, Disabled In Action, NYPIRG Straphangers Campaign, People’s MTA, Riders Alliance, Rise and Resist, TransitCenter, United Spinal Association, UP-STAND, held a press conference and vigil on January 30, 2019 outside the 53rd-7th Avenue subway station, to assert that the tragedy of Malaysia Goodson will not be in vain, urging Governor Cuomo to settle the lawsuit with a commitment for a plan of full subway accessibility. 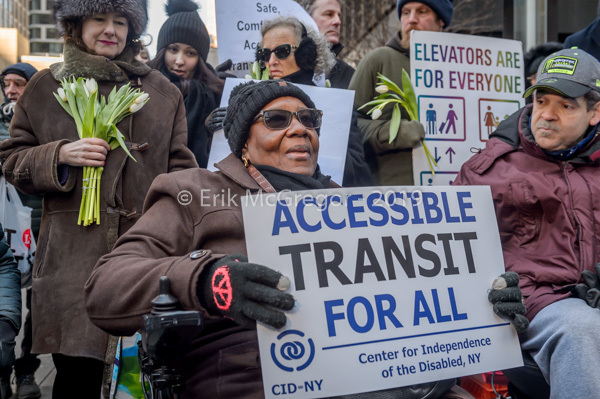 Currently, fewer than 25% of the city’s subway stations are accessible. 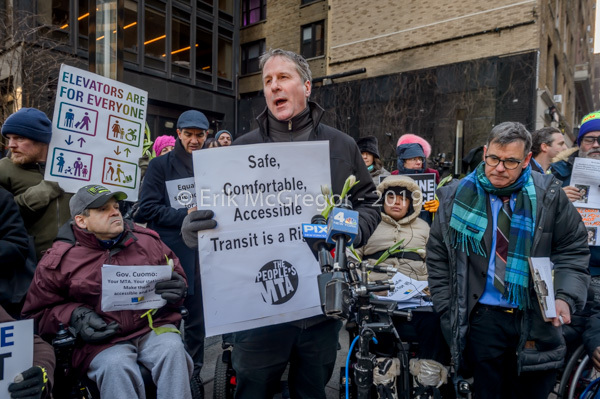 In 2017, many of the groups sued the MTA, which Gov. 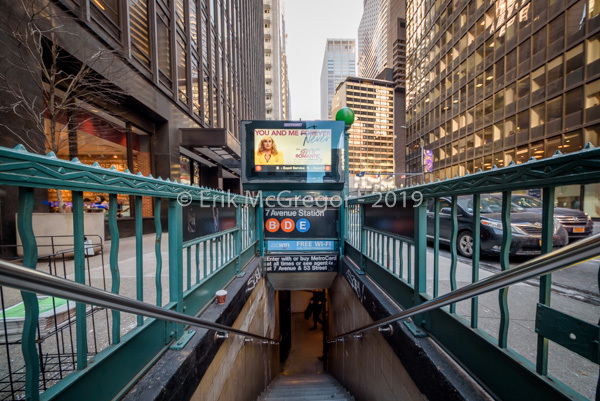 Cuomo controls, in state court charging the lack of subway elevators is a violation of the city’s Human Rights Law. 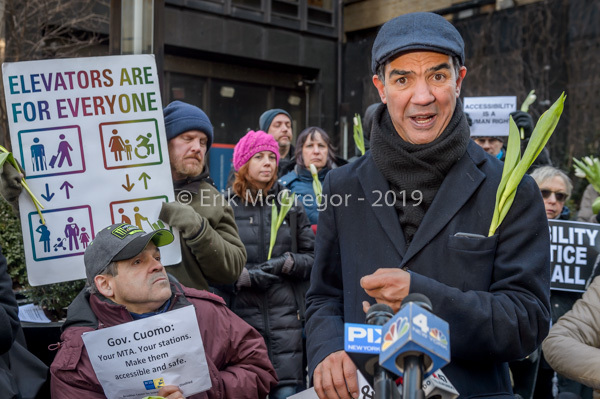 The governor and the MTA have not settled the lawsuit. 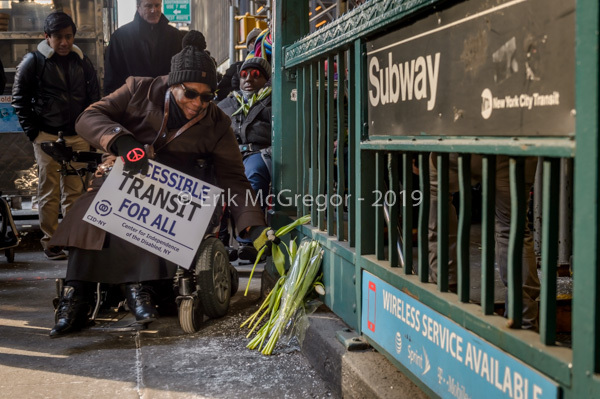 All New Yorkers send condolences and sympathy to the family of Malaysia Goodson, who tragically died at this subway station on Monday after she fell down a flight of stairs carrying her baby in a stroller. very nice photos that morning. glad to have participated.